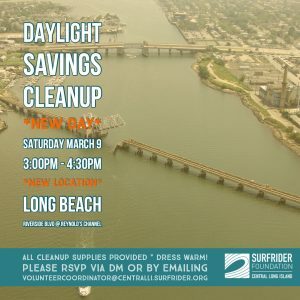 Surfrider has a variety of ways to get you involved in our mission. We can always use more hands to help us protect and enjoy our beaches. We can always use another set of hands in our efforts to protect our Oceans, Waves, and Beaches! Please email our Volunteer Coordinator at volunteercoordinator@centralli.surfrider.org with any questions about opportunities. 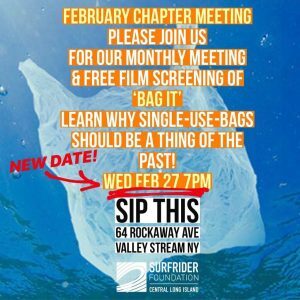 Check out our calendar to see what we have planned and follow us on Facebook and Instagram to stay informed about our latest events! We will have some specific job descriptions up here shortly so please check back. 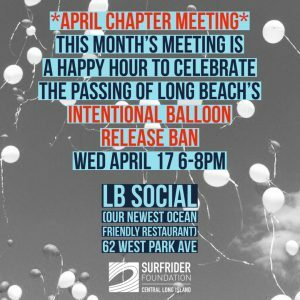 April Chapter Meeting- Happy Hour Celebration for the passing of Long Beach’s Intentional Balloon Ban! 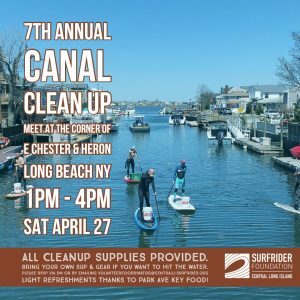 Participate in a beach cleanup with Central Long Island Chapter chapter!